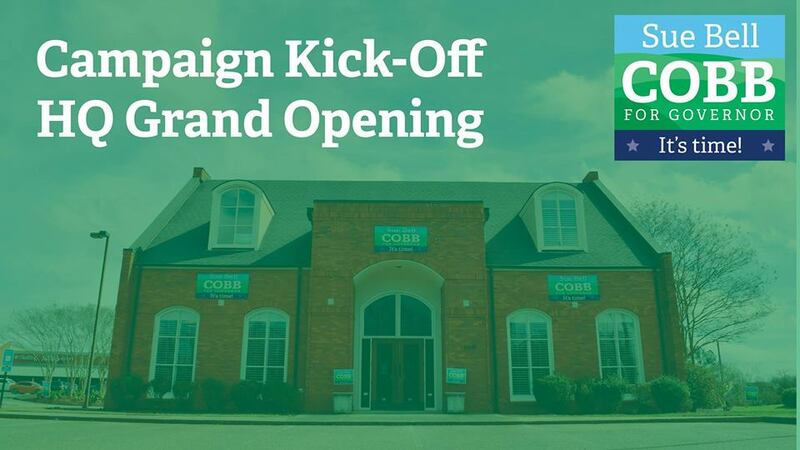 With three months to go until the Democratic primary, former Alabama Chief Justice Sue Bell Cobb kicked-off her campaign for governor Monday at her new campaign headquarters in Montgomery, Ala.
“Please join me as we kick-off this journey and open the doors to our statewide office. With your support, we can make sure the governor’s office is exactly like my campaign headquarters: open to every Alabamian,” Cobb said ahead of her campaign kick-off. At the event, Cobb discussed her what priorities as Governor will be. Among them, is the creation of the Lifelong Learner Lottery with all revenue committed to education and safe from the whims of legislators. Mississippi and Nevada, that collect millions in taxes on casinos, are the only other states in the lower 48 that do not have a lottery. Under Cobb’s proposal, new funding would be used for first-class educational childcare, state-of-the-art career tech education to prepare our workforce for 21st Century jobs and attract businesses, and to fill the gap left by Pell Grants, so Alabama students of any age who qualify for Pell Grants can attend college without worrying about tuition. Cobb was elected the first female Chief Justice of the Alabama Supreme Court, where she made Alabama the first state in the nation to implement electronic filing of all court cases, saving judges and court personnel hundreds of hours of work, and Alabama taxpayers tens of millions of dollars. During her time on the court, she also implemented drug courts in 66 of 67 counties, saving abusers and their victims by breaking the cycle of jail and addiction. Cobb is hoping to follow in the footsteps of recently elected Sen. Doug Jones — winning a statewide office as a Democrat.